In the first video below, what do you see? A cursory look might show you two rats who are watching their human videotape them. They sit there quietly, alertly, and in the end skitter away, having been triggered perhaps by the movement of the human or the noise of the camera. 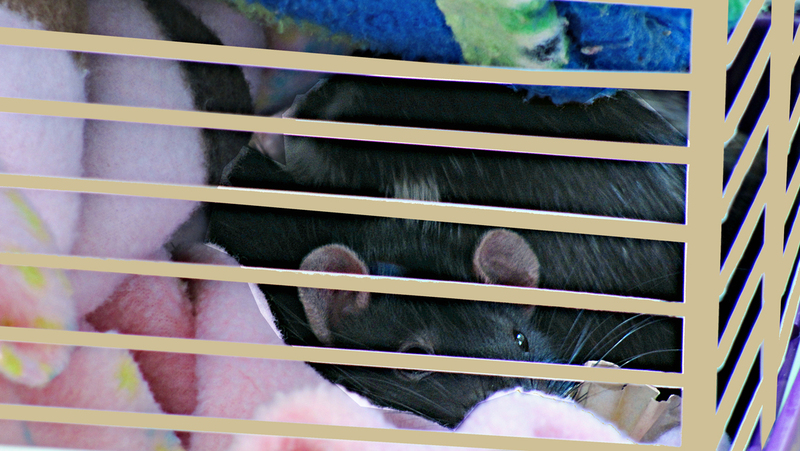 The reality of these two rats is that they are completely new to my home, and, they are very, very aggressive. I adopted them deliberately, intending to help them. (I did, but that's another story, found here and here.) Aggression, at root, is based in fear, so not only are these 2 rats extremely fearful in general, they are in a new home with a stranger who is aiming a strange metal noisy thing at them, so their fear is further amped up. I thought it would be helpful to start with this video, because it shows two rats sitting quietly, presumably not doing much of anything, which is misleading. I see Pemy and Dicey in Extreme Alert, ready to flee - or BITE - if necessary. 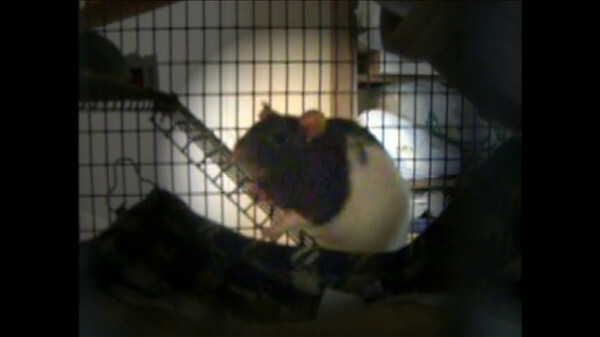 These images and videos illustrate behaviors of frightened or aggressive rats. By becoming familiar with the body language of fear in rats, we can work to not purposefully or inadvertently trigger such behaviors. If we do see these behaviors, this would signal that we should do something else so that fear behaviors aren't triggered. Leslie was on the ramp and I decided to film her. She quickly went into a fear freeze pose and sat there. BethAnn came down the ramp, behind Leslie. BethAnn went into a fear freeze position on top of a small box, underneath the hammock. Stripette poked her head out of the box on the upper level but did not come out to investigate. The girls' fear level was about the same after I opened the cage door.